It’s Spring! Well the plants seem to think so. We went out to survey the garden situation (code: disaster) and start clearing a path to spring planting. The asparagus has started to poke up, the rhubarb is leafing out, the fennel is full ferny swing and the plum trees are flowering. These are serious signs of spring here in N. California. We have our first crocus out. The hyancinths are blooming in pots. The peonies are pushing up leaves. But the most spring like thing to us? 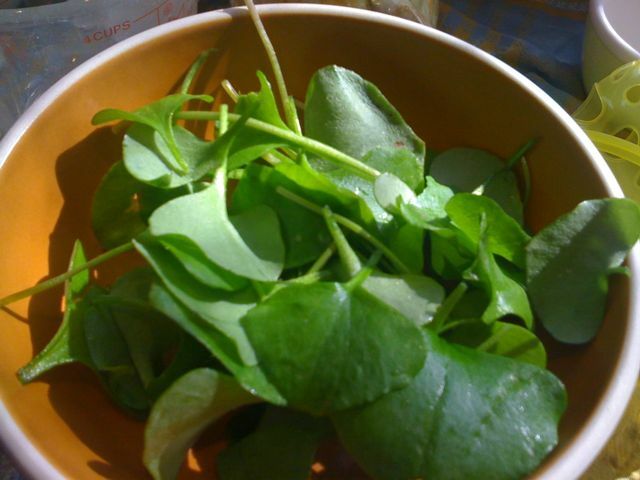 Miner’s Lettuce. Young spade shaped leaves not yet flowering. Trent went foraging and picked a handful and then I went out to help turn it into a bowl-full. Funny how many of the leaves end up in your mouth. Trent was positive that dewdrops make Miner’s Lettuce taste better – but he conceded that perhaps it tasted only a little better than Jack’s salad dressing. Make sure you really know what you are eating/picking. Don’t just guess. Otherwise forage with your eyes, not your fingers and mouth. Better – wash what you pick before you eat it. Don’t pick all that you see. Leave some for the plant, some for the wild life. Don’t demolish a patch of anything! Pick a little here and there. Take pause and look at what you are picking. Is there enough growing here to take some? Enjoy being with your kids.